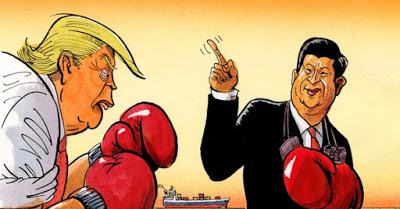 In a recent post I explained that China’s manipulations of its own currency hurt only herself and not her trading partners and, therefore, retaliatory tariffs were not warranted and would be self-defeating anyway. China harms herself by causing her own money supply to expand, which destroys capital through malinvestment and causes prices to rise domestically. Retaliatory tariffs cause American goods to rise in price, resulting in a recession and generally lower standard of living. Few economists claim otherwise. It seems that everyone is in favor of free trade, as long as it is the other guy who must compete with foreign products. When it comes to their own products, the most typical response from American manufacturers begins with the caveat that “although free trade is beneficial most of the time, it causes harm under certain circumstances.” There follows a convoluted chain of cause-and-effect purporting to prove that lower priced foreign goods would hollow out America’s key manufacturing industries and turn America into a second class nation. The purpose of this brief response is to counter these claims and explain why understanding economic theory is vital to the argument in favor of free trade. There are two books which address the fact that we cannot experiment with an economy the way that physical scientists do. We must use logic to form irrefutable conclusions of what MUST happen, even if we cannot see it! The first is Frederic Bastiat’s early nineteenth century classic That Which Is Seen, and That Which Is Not Seen . Henry Hazlitt’s updated the book a hundred years later in order to appeal to modern readers. His Economics in One Lesson employs a series of short stories to illustrate that one must always consider the economic effects of an intervention on all and not just a few actors, plus, that one must look to the long term effects of an intervention and not just the short term effects. So, let’s use logic to consider the effects of China’s economic interventions on itself and its trading partners who do nothing to retaliate against China in any way. 1. China uses its capital in an inefficient way . Outright subsidies to any industry must be paid by someone. The very fact that China believes that it cannot compete in certain industries to its own satisfaction without subsidies is an admission that these industries are inefficient. Therefore, Chinese internal subsidies are transfers of capital from more efficient industries to less efficient industries. Put another way, if the targeted industries already were very efficient, more capital would flow to these industries and subsidies wouldn’t be necessary. 2. Monetary expansion to fund an industry causes overall higher prices and malinvestment. This is the classic Austrian Business Cycle Theory. China may very well expand its steel industry, for example, with monetary expansion, but such action will disrupt the time structure of production and result in a higher price level and a recession. Other factors of production that feed the Chinese steel industry will rise in price, necessitating another round of currency expansion, which will lead to even higher prices and another recession. It’s a vicious cycle that can end only with an end to currency expansion. 3. China’s overall economy will be less developed, weakening the impact of subsidies to targeted industries. Because capital is stripped from more efficient industries, China’s ancillary industries will be less developed, harming the targeted steel industry indirectly. Public infrastructure may be less than it would be otherwise, for example. The many business-to-business goods and services that feed the steel industry will lack the capital to expand. The workforce may lack adequate education. The list is endless. China’s economy will lack coordinated growth, as was so apparent in the moribund economies of the old Soviet bloc. The point is that something must be sacrificed to aid the targeted industry. Of course, this is a classic Bastiat “Not Seen” scenario. 4. American products get cheaper and gain market share. It may be true to some small extent that the steel industry, for example, may not be able to expand and may even contract in the face of equal quality Chinese steel that can be purchased at lower prices. But all the many American manufacturing firms that USE steel will have a lower cost of production and, therefore, will be able to expand their markets. Again, something has to give; i.e., the Chinese may be able to sell more steel to American manufacturers, but these manufacturers can sell more finished goods into the world market. 5. American industries benefit from the general expansion of all levels of production. This is a corollary to number three above but opposite. Because the companies that use cheaper Chinese steel reduce their costs, passing along the savings to customers in the form of lower prices, passing along the increased profits in the form of dividends to shareholder, increased investment in their own firms, or a combination of above. The reason for this beneficial prospect is that America becomes more capital intensive, and that capital came in the form of a gift from China. 6. Chinese subsidies actually become subsidies to Americans’ standard of living. The purpose of production is consumption. Although we may give lip service to how much we love our jobs, what we really mean is that we are satisfied with the life style that we can obtain through meaningful labor. I truly doubt that many of us would work if we were not paid. Chinese subsidies allow us the option to work less for the same standard of living or work as long yet enjoy a higher standard of living because our pay goes further. We workers have more options. For example, as we become richer through Chinese subsidies, mothers may opt for part time work instead of a full time job, or they may leave the workforce altogether. Fathers may decide to pursue lower paid but less stressful careers. Let us not forget that leisure is a valuable good in and of itself. Finally, the idea that all subsidies can be eliminated worldwide and businesses can compete on a level playing field is a foolish idea. What is the definition of a subsidy? Is it government provided healthcare? How about a state or municipality forgiving business taxes in order to entice industries to expand or relocate? If the government builds a super highway near a plant, is this a subsidy? Likewise, industries in many developed economies decry the fact that undeveloped countries have lower environmental standards, worker safety requirements, and worker rights. Periodically one reads that the European Union is threatening a member for having taxes that are too low and, thus, provide an indirect subsidy. Capitalists must accept all of these interventions by foreign governments as part of the unknown and uncontrollable factors of conducting business and not lobby their own governments to take self defeating economic reprisals. Unilateral free trade is the best and only real option.